•You may need to split a polyline and introduce a node to the network. This would allow you to create a confluence with correct connectivity. 1.Start an edit session on your river network. 2.Select the polyline that requires splitting so it is highlighted as shown below. 3.Select the split tool ( ) located on the editor tool bar and click on the polyline where you want the split to occur. The original polyline is deleted and replaced by two new polylines. The split process will carry over any existing attribute values. This is OK when the attribute is common to both polylines (e.g. river name) but the node information and any measurement value will be incorrect. 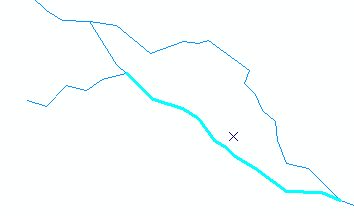 Splitting a polyline into 2 is altering the topology of the network and will influence the whole network. You must re-run all RivEX attribution processes again!